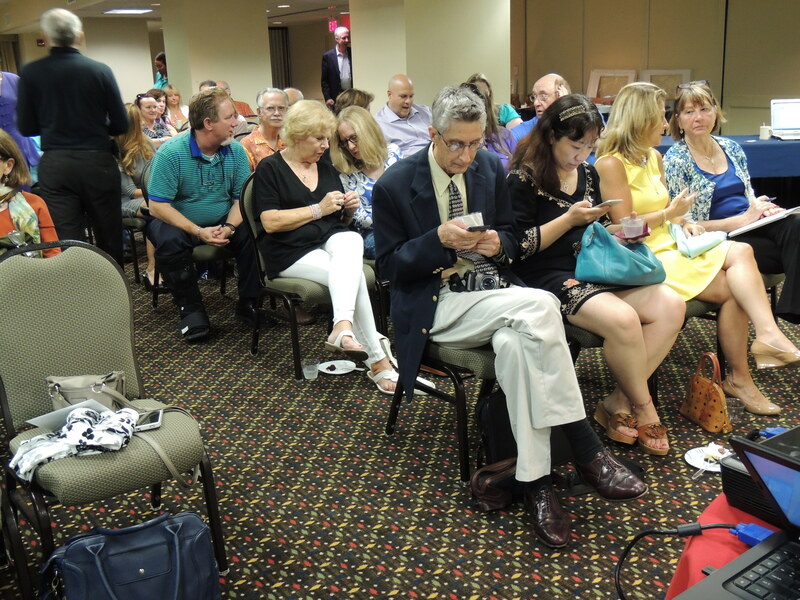 Alan Bronstein discussed the many beautiful creations nature provides as natural colored diamonds, in front of a full house of National Association of Jewelry Appraisers (NAJA) conference attendees and DCGIA members. Like flowers in a garden, diamonds cover every color and shade, to hold us in awe and appreciation. We were captivated with the brilliance, fire and color of each diamond Alan shared as well as the personal stories of previewing the Argyle Diamond Tender for colored diamonds he collected and dealt with during the past decades. Visit: Aurora Gems for some wonderful pictures of colored diamonds. Interest in fancy colored diamonds has caused demand to increase over the last 10 years. This has caused great strain on the very limited supplies and strong upward pressure on prices. The cut of fancy colored diamonds is usually selected to maximize the intensity of the color rather than to maximize light return, which would lessen the richness of the color. The best cut for colored diamonds, is one that gives the strongest face-up color. So when cutting a colored diamond, the cutter wants a shape that will balance maximum brilliance and maximum color. GIA’s standard D-to-Z color grading system is based on the relative absence of color in diamonds, from colorless to yellow or brown, which are the diamonds most common in the retail market place. For Fancy Colored Diamonds, GIA’s colored diamond color grading is based on the presence of color. There is a wealth of information at GIA’s Website GIA describes color in terms of hue (the color), tone (relative lightness or darkness), and saturation (intensity). Hue (like pink) is modified by a “Fancy-grade” term (Fancy Light, Fancy, Fancy Intense, Fancy Deep, Fancy Vivid or Fancy Dark) which describes the effect of both tone and saturation. Get a copy of the GIA COLORED DIAMONDS COLOR REFERENCE CHARTS “here soon” See natural diamonds in all their colors, and where they appear on the GIA colored diamond grading scale. Nature has given birth to many beautiful things, and among the rarest are natural colored diamonds. Colored diamonds, whether of a pure color or modified by one or more colors will always fall in a range of description based on its primary color and modifier colors if any, to include the saturation strength, vividness or amount of color present, as well as the value or tone, the scale or measurement of lightness to darkness, or white to black. Nomenclature used by most labs, such as Light, Fancy Light, Fancy. Fancy Intense, Fancy Vivid, Fancy Deep and Fancy Dark, take into account all levels of lightness, saturation, value and tone. But the dividing line between such grades can often vary between competing labs. Nomenclature used to describe the color of a diamond, Purplish Pink, will presumably take into account any stone that has a primary visible color of pink, and a secondary or modified color of purple. As long as the primary color is seen as pink, the percentage of the purple modifier can vary from 1% – 49%. 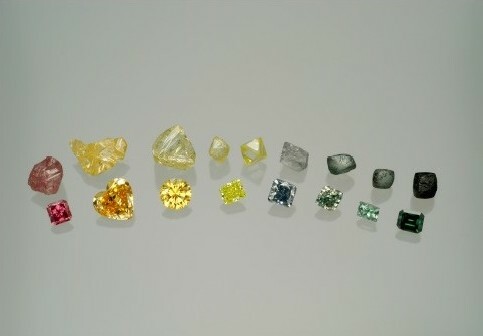 While a scientific description of natural colored diamonds, it is a subjective grading and nomenclature choice, which allows differences of opinion between labs. The ranking of this nomenclature can have a major effect on the “perceived” value and desirability by customers. Beauty is not definable by a grading report or color description. Beauty is in the eye of the beholder, different to every individual and to every colored diamond. Fancy color diamond, shape, color and idiosyncrasies are what make it beautiful and unique. Only a small percentage of diamonds show good saturated color, the color of diamonds is due to minute traces of other elements, or defects in the crystal structure. Nitrogen causes a yellow color, while boron causes blue. Radiation damage to the structure of diamond causes green, while pink diamonds result from dislocations with-in the crystal structure itself. Colored diamonds are often best viewed in comparison with something that contrasts with what you want to see, not with something similar. In the case of colored diamonds, rough often does not show the color that cutting will yield. 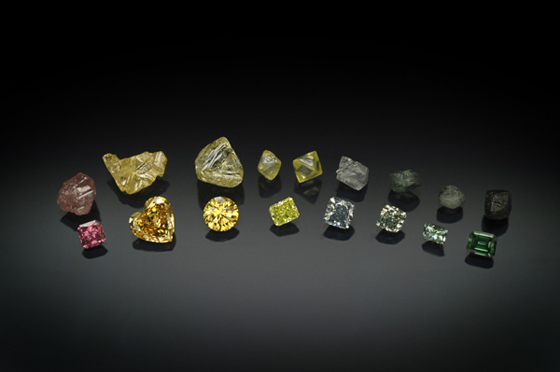 Looking at the picture of Colored Diamonds Rough & Polished, the Blue Diamond fifth from the right, shows almost a colorless rough from which a similar blue color might come once cut. GIA grading system tends to describe colored diamonds scientifically while also making it commercially valuable. Customers want something with a Fancy Vivid nomenclature on a report, seeing the color of the stone is often not enough. Only a third of the world’s diamonds fluoresce when exposed to UV light. The color of emitted light may be very different from the diamond’s color in normal daylight. 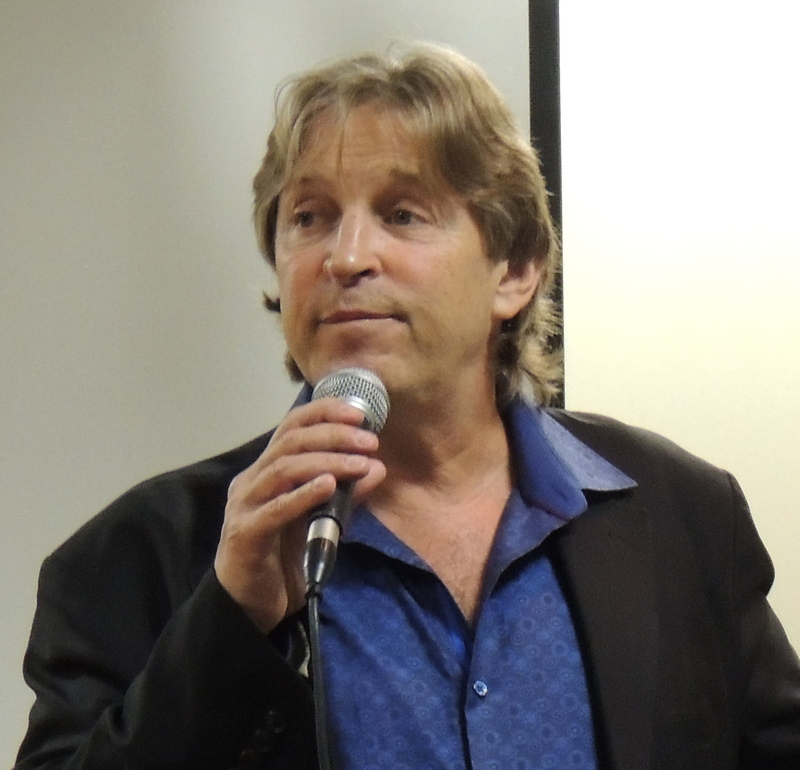 We will never look at a colored diamond, much less a flower, without thinking of the wonders of nature and Alan’s passion for colored diamonds. DCGIA & NAJA both THANK Alan for sharing his passion with us all. This entry was posted in Meeting Archives and tagged Alan Bronstein, Aurora Gems, color grading, Fancy-grade, gia, NAJA, natural colored diamonds. Bookmark the permalink.